FIGURE 3.15. Budgets of annual nitrogen flows (gNm 2yr 1) in the four cropping systems. See Figure 3.14 for further explanation of symbols (from Paustian et al, 1990). production was 50% greater in the perennial ley fields than in the barley treatments, with soil meso- and macrofauna biomass, consumption, and respiration being significantly higher as well. The main conclusions drawn from this impressive long-term (10-year) study is that microbial and faunal (biotic) interactions do occur, and they have a significant effect on nutrient turnover. 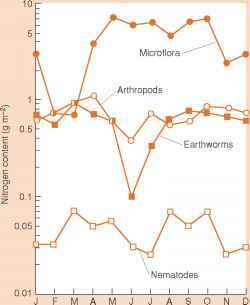 As we note in Chapter 8, with current considerable concerns about the impacts of land use change and global change phenomena on key processes in soils, it is imperative to measure explicit changes in numbers and taxa of soil organisms that carry out these processes.